Shaikh Baba-al- Dini Mohammad famous as Shaikh Baha'i: was the well known Islamic scholar of the eleventh century Hijrah. His genealogy dates back to Haris Hamadani, the famous companion of the Commander of the Faithful, Imam Ali (R.A.). He was born on 17 Moharram, 953.H.l20 March, 1546 in a village near Baal'bak in the Jabal Amel area of Lebanon. Mohammad ibn Ali ibn Mohammad ibn aI-Husain Hur Ameli, the famous Shia theologian and traditionalist, whose genealogy traces back to Hurr ibn Yazdi al Riyahi. He was born in 1033 A.H.l1623 A.D., and expired in 1104 A.H.l1692 A.D., and compiled 22 books,the most famous is "Wasa'el ush-Shia", a vast collection of Shia Ahadith. His tomb is located in the Sahn-e-Enqelab on the side of Madrasah Mirza Jafar. Rabie ibn Haitham al-Asadi as- Thaure was a pious person and a close companion of the Commander of the Faithful, Imam Ali (AS.). His tomb is in the middle of a garden, bearing a high dome. Its construction dates back to II th century Hijrah/seventeenth century AD., and is considered as a Safavid monument. His death is recorded in 63 AH.l682 A.D. 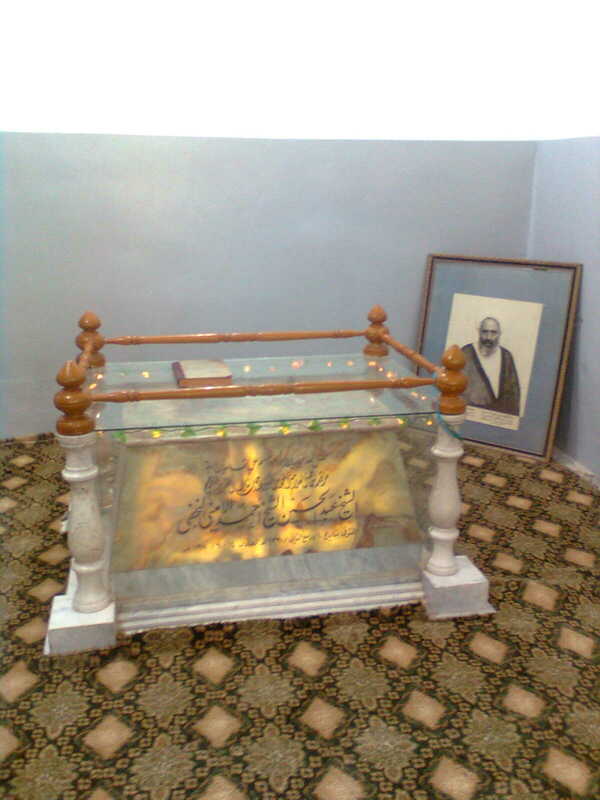 There are two inscriptions written by Ali Reza Abbasi inside the shrine. It is located at the end of Khwajeh Rabie Avenue. Khwajeh Rabie's tomb is among the important buildings of ShahAbbas I period in Khorasan. One of the biggest public cemetries ofMashhad lies next to the tomb ofKhwajeh Rabie. Herthameh ibn Ayn known as Khwajeh Morad was a disciple ofImam Reza (AS.). His death occurred in 210 A.H. /825 AD. His tomb is 14 km. offin the south east of Mashhad in the outskirts of Binalood Mountains on the country road in front of Behesht -e- Reza (AS.) Cemetry. ShaikhMohammad Aref died in 985 A.H.l1 577 AD. famous as Peer -e- Palandooz was one of the most pious persons of his time. He was called so, since he made pack saddles to earn his living. 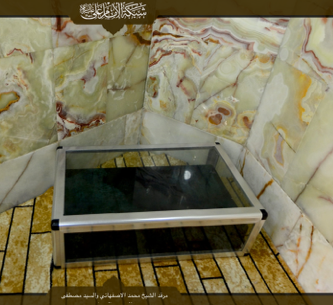 His tomb is in front of Lower Bast (Bast -e- Payeen), which was originally built by Sultan Mohammad Khudabandeh and has recently been reconstructed by Astan Quds Razavi. This dome is locatod in Khaki Avenue and its dome is the same colour close to turquoise. Shaikh Mohariunad Mo'men Aref Astarabadi died in 90 A.H.I 708 A.D., is buried here. He wrote Tohfeh Hakim Mo'men, which is a medical work. The dome was built by Shah Abbas Safavi in 1011 AH.l1602 A.D. The distinguished scholar, Ayatollah Hasan Ali Murvarid, was born on Shawwal 8th, 1329 A.H. in the holy city of Mashhad. He lost his father in 1337 A.H. and according to his father's will, he was taken under the care of Haj Sheikh Hasan Ali Isfahani Nukhudaki and his respected mother. He has benefited the lessons of some distinguished scholars including Haj Sheikh Hasan Ali Isfahani Nukhudaki and Haj Sheikh Hashim Qazvini. Allamah Ayatollah Mirza Mahdi Isfahani (1303-1365 A.H.) was his most distinguished seminary professor. Ayatollah Murwarid started teaching seminary sciences after the death of his respected professor, Mirza Mahdi Isfahani. Many of the seminary students and the researchers of the Islamic sciences attended his classes for more than forty years. Ayatollah Murvarid was also one of the colleagues and close friends of Ayatollah Mirza Jawad Aqa Tehrani. Ayatollah Murvarid had an important role in the glorious victory of the Islamic Revolution. He was one of the members of “the seven-member group for administering the affairs of the Khurasan province”, soon after the victory of the Islamic Revolution. During the struggle for the Islamic Revolution, he was one of the strong opponents of the Pahlavi regime. Ayatollah Murvarid, along with other distinguisged figures approved and signed the announcements issued by Imam Khomeini (R.A.) opposing the Pahlavi regime. People from different sections of society respected him for his moral and noble character as well as his simple life. In addition to teaching Islamic sciences and training students, Ayatollah Murvarid rendered many social and scientific services including establishing several schools and scientific-propagative institutions. At present, the seminaries of Be’that and Sa’adat, established by late Ayatollah Murvarid, receive the students of the Islamic sciences. He was the collective prayer leader in Mirza Ja'far Islamic seminary, Haj Mulla Hashim Mosque and Mulla Heider Mosque; many pilgrims used to participate in these communal prayers. In fact, these locations were also the gathering places for the scholars. Ayatollah Murvarid used to visit the holy shrine every day and insisted on this, even in spite of his old age and sickness. Finally, this distinguished scholar passed away in Mehr 1383 at the age of 96, and was buried in Dar-al-Surur portico in the holy shrine of Imam Reza (A.S.). Haj Sheikh Hasan Ali Isfahani, known as "Nukhudaki"- son of Mulla Ali- was born on Zi-al-Qa’dah in 1279 A.H. in Isfahan. He received the preliminary education from his respected father, and then achieved mystic levels in the presence of his reverend teacher, late Haj Mirza Sadiq. Then he learned mathematics, astronomy, Fiqh (Jurisprudence), and Usul (theology) from late Mulla Muhammad-i-Kashi. After acquiring philosophy and rational sciences, he went to the holy citiy of Najaf, where after acquiring religious asceticism and spirituality, he attained high spiritual positions and wonders. Then, he returned to Isfahan and later to the holy city of Mashhad. A revelation occurred to him in Mashhad that persuaded him to reside in Mashhad forever. Finally, this distinguished scholar passed away in 1361 A.H. at the age of 82 and was buried in the northern side of Inqilab courtyard, adjacent to the Abbasi Balcony. Haj Sayyed Muhammad Hadi Milani was one of the distinguished religious leaders and professors of Mashhad's Seminary. Late Ayatollah Milani was born in 1313 A.H. in a religious family in the holy city of Najaf. He learned the preliminary sciences of Islamic seminary from Sheikh Ibrahim Hamadani and Akhund Mulla Hussein Tabrizi and the Sath sciences from late Ayatollah Sheikh Ibrahim Salyani, late Sayyed Ja'far Ardebili and some other famous scholars. Then, in 1332 A.H., he migrated to the holy city of Mashhad with the intention of residing in this city. He occupied himself with teaching the Islamic sciences of Kharij Fiqh and Usul. Furthermore, he established the seminaries of Imam Sadiq (A.S.) Seminary, the Husaini Institute for the Islamic Sciences, and Milani Seminary. 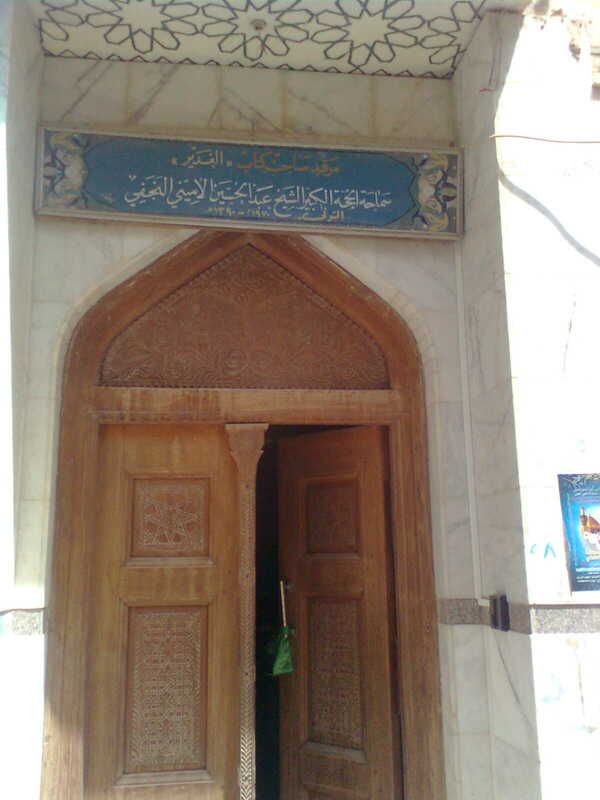 Ayatollah Milani passed away in the month of Rajab in 1395 A.H. and was buried in Tawhid Khanah portico. Haj Sheikh Ali Akbar Nahavandi, son of late Sheikh Hussein Nahavandi, known as “Tajalli”, was one of the distinguished scholars, commentators, and teachers of Astan Quds Razavi also known as “Zein-al-Ulama wa-al Mufasserin” [adornment or chief of scholars and commentators]. He was born in 1291 A.H. in Najaf. In 1317 A.H. he traveled to Mashhad along with his brother to take part in the classes of his brother, Sheikh Hasan Ali Tehrani, Haj Sheik Ismaeil Turshizi, and Mir Sayyed Ali Haeri Yazdi, the then-distinguished scholars. He achived the religious leadership (Ijtihad) confirmed by all these sholars. Then, he left Mashhad for the shrine cities of Iraq and in Karbala, Najaf, and Sameria, he took part in the seminary classes of Sayyed Ismaeil Sadr-i-Isfahani, Akhund-i-Khurasani, Sayyed Muhammad Kazim Yazdi, Haj Mirza Hasan Khalili Tehrani, Sheikh Abdullah Mazandarani, and Mirza Muhammad Taqi Shirazi known as “Mirza the second”. In 1329 A.H., he returned to Mashhad and after his brother died, he took the helm of religious affairs in Mashhad. He was teaching in Mirza Ja’far Seminary while also compiling and looking into people’s problems. “Tafsir-i-Nafahat-al-Rahman (in 4 volumes), “Zyia-al-Absar Fi-al Mabahith-al-Khyiar”, “Diwan-i-Zubdat-al-Masaeib”, “Siraj-al-Nahj in the Haj pilgrimage Affairs”, Commentary on the book “Al-Salat” written by late Haeri, and “Khelal-al-Salat” are some of his works. Ayatollah Sheikh Muhammad Nahavandi was one of eyewitnesses of the bombarment of the holy shrine in 1330 A.H. and has pointed to this event in his Diwan. He knew the whole Qur’an by heart and was involved in political affairs. He had close relation with Ayatollah Kashani. Finally he passed away on Rabi’-al-Akhir 25th, 1371 A.H. and was buried in Astan Quds Razavi. 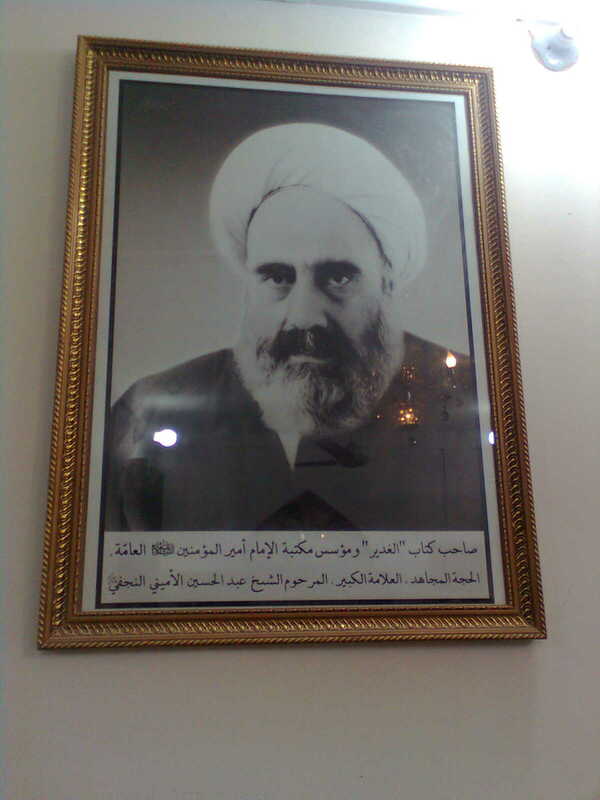 The famous preacher and pious scholar, Sayyed Abd-al Karim Hashimi Nejad, was one of the distinguished and militant scholars. He was born in 1311 H.S. in Behshahr city. At the outset, he started his religious studies in the seminary classes of Ayatollah Kuhestani. Then, he went to Qum to continue his studies. In this city, he took part in the seminary classes of Ayatollah al-Uzma Burujerdi (R.A.) and Ayatollah al-Uzma Imam Khomeini (R.A.). After completing his studies, he travelled to the holy city of Mashhad to teach Islamic sciences and also propagate and spread the Islamic teachings. Martyr Hashemi Nejad was arrested several times by the security agents for his ceaseless struggle against the Pahlavi regime and was imprisoned for a while. He was one of the leaders of the Islamic Revolution in the holy city of Mashhad. Finally, the terrorist hypocrites martyred him on Mehr 7th, 1360 H.S. in Mashhad. 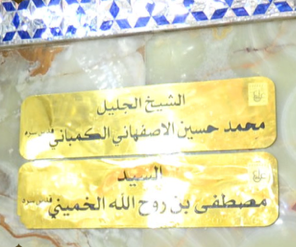 His holy body was buried in the northeastern side of Dar-al-Salam portico. This revered martyr has also left behind several valuable works. Haj Sheikh Muhammad Vale was one of the well-known scholars of the seminary of Mashhad and a symphatetic preacher. He was born in Kashmar on Dey 3rd, 1312 H.S. and completed the preliminary as well as Sath studies in this city. A great wealth came down to him from inheritance; however, he spent all his wealth on helping the poor and spreading the religious, Qur'anic and Islamic culture. He immigrated to Mashhad at the age of 25 for residing in this holy city and continuing his religious studies. In Mashhad, Haj Sheikh Muhammad Vale took part in the religious and Islamic sciences classes of some famous scholars including His Eminence Ayatollah Sheikh Hashim Qazvini, and His Eminence Ayatollah Mirza Jawad Aqa Tehrani. He took the kharij lessons in the presence of Ayatollah Mirza Hasan Ali Murvarid. His ethics classes were great. Haj Sheikh Muhammad Vale passed away on Ordibehesht 22nd, 1375 H.S. while praying at dawn. He was buried in Azadi courtyard, block 24. Sheik Fadl Allah Noori. (room 41 in shrine) Sheik Shaheed was born in the hamlet, Noor, of Mazandaran in 1258 H. He had his early education with his father and in his youth he went to Najaf e Ashraf for further studies. He had a keen eye for scholastic details and was an adept at explaining intricate matters to his disciples. He always confronted the forces of colonialism. He also exhorted his disciples to oppose imperialism. Because of his philosophy of opposition to colonialism he returned to Iran and because of his awareness of the political scene he assumed the leadership of the movement. He exposed the conspiracy of the colonialists. Because of the traitrous behavior of some members of the movement he was arrested. He was produced in the military court of Bairam Khan Armani and was sent to the gallows in great hurry! On the day of the birth of Hazrat Ali (a.s), Rajab 13 he was hanged to death. The mausoleum of Shaheed Fadl Allah Noori in the complex of Masooma e Qum is visited by the admirers of the Shaheed even to this day. same as http://www.islamic-laws.com/marja/mohaddisnoori.htm buried in iraq or iran?